If you would like to donate to the Reunion Fund, we would greatly appreciate it. Donations help keep the price of tickets down for future reunions. 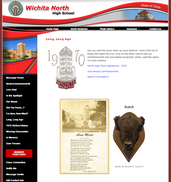 Please consider making a donation to help support the North Class of 70 website. Hello North High Class of 1970! MARK IT DOWN AND START PLANNING NOW TO ATTEND THIS FUN-FILLED WEEKEND!! LOOK AT THE MISSING CLASSMATES LIST AND IF YOU KNOW ANYONE'S WHEREABOUTS, CONTACT THEM TO JOIN THE SITE. IT'S A GREAT WAY TO RECONNECT WITH OLD FRIENDS AND LEARN ABOUT REUNION AND OTHER NEWS ABOUT OUR CLASS. 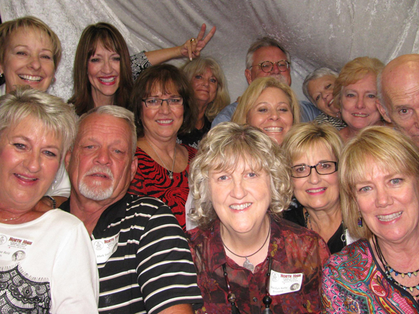 As you rest up applying Icy Hot and heating pads to aching muscles from all the non-stop dancing at last weekend's 45th Reunion, you may want to browse through some pictures. There will more added soon, so check back frequently. Click on the Photo Gallery link at the top of the page. Don't forget we have a Facebook Page and pictures are posted there, too. Shelly Branda Moore, Deb Morris Ketcherside, Lynda Green Gilmore, Kim McGinness Honeycutt, Bill and Linda Guerra Powell, Kathy Viney Baldwin, Sherry Nichols Evans, Steve Miller, Mark and Roxanne Reiz Smith, Marilyn Kelly Browne, Reba Pierce Chrisler, Kim Richardson Santellan. Missing are Rosemary Falconbridge Miller and Joe Wolf. The photographer said we couldn't put more in.